We love this time of year! Sure, we're sad to see summer go, but there's something about "back to school" time that gets us feeling extra motivated to take on the dental world. I think most people would agree that although summer is fun, it feels good to get back to basics and reestablish routines and habits that may have gotten lost at last weekend's [insert summer distraction here]. And, since we're doing a little "brushing up" (sometimes I can't resist) on the the basics ourselves, we figured it wouldn't hurt to give you a refresher course on how to properly care for your teeth. Class is now in session! Let's first talk about supplies. You will obviously need a toothbrush, but what kind? Our preference is the Phillips Sonicare electric toothbrush, but an old fashion manual toothbrush will also fit the bill. Just make sure you choose one with soft bristles. Contrary to popular belief, medium or hard bristle brushes are not a better option because they scrub your teeth harder. In fact, those gnarly bristles can actually do more harm than good. Dental floss is essential! Waxed or ribbon, mint or bacon flavored (no joke! 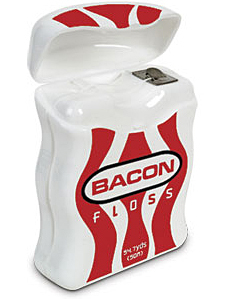 ), whatever your preference, make sure you have floss. Toothpaste is also a matter of preference, but we do recommend you choose a brand with fluoride. Now we need you to put these products to work. You should brush your teeth at least twice a day and preferably after each meal. Evening brushing is especially important. The last thing your teeth need is your dinner blanketing them the whole night through. Flossing should be a once daily ritual. Evening flossing is usually easier to maintain, while morning flossing is easily skipped in efforts to get out the door on time. Just remember that flossing comes before brushing and that it's absolutely necessary to maintain your optimum dental health. The final component in being a star dental pupil is regular visits with us. We like to see most patients semi-annually for a professional cleaning and exam, and we take screening x-rays once annually to confirm your teeth are cavity free. We'll fill you in on our findings at the end of your visit and give you any "treatment assignments" we feel would be beneficial. There you have it! Stay the course and you'll reap the rewards of an A+ smile well beyond your educational years. New "students" are always welcome. Contact us today to arrange a visit!